Jan Baker had an idea. 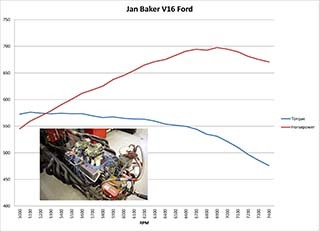 A longtime racing fan, he always felt like Ford should have built a V12 engine to compete with the likes of Ferrari at LeMans back in the '60s. Of course, Ford never built a V12 for racing, so Baker took matters into his own hands and built one himself. Baker started with two 302 blocks, and with some strategic cuts and careful welding came up with a V12 block. The cylinder heads were originally three cast iron Clevelands cut up to make two. Baker says he was careful to create the joints in the heads and the block in different places to keep from creating a seam across the engine. Except for the custom crankshaft and cam, almost everything component on this engine is an off-the-shelf part or made in-house by Baker or his son Tim. 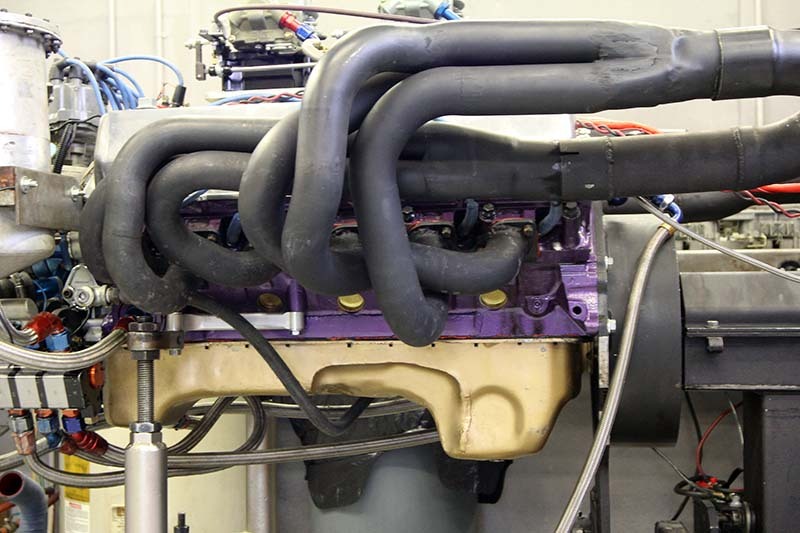 The engine uses 4.090 inch bores with a 3.500 inch stroke to produce 552 cubic inches. 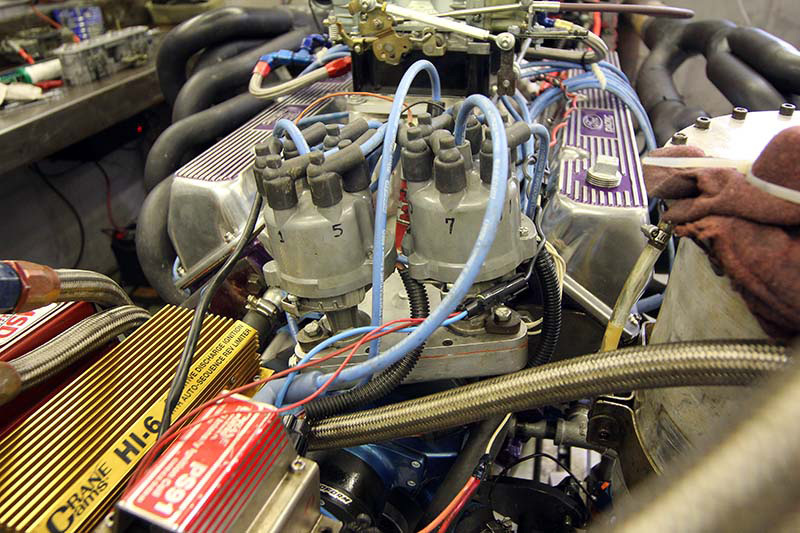 As he worked out all the kinks, Baker considered the V12 as two straight-six engines mated side-by-side. For example, their are two separate ignitions and coils as well as two external oil pumps. Oh, and the firing order is 1, 7, 5, 11, 3, 9, 6, 12, 2, 8, 4, 10 just in case you are keeping score at home. We caught up with Baker and his creation when the V12 was getting its first tuning run on the engine dyno at Automotive Specialists in Concord, NC. Baker was trying a few different carburetor setups, but the straightforward dual Holley four-barrels seemed to work best. A water leak cut short the testing while we were there, but after just a few runs the engine was already producing peaks of 697 horsepower and 576 lb/ft of torque. Instead of trying to draw up some V12 ignition from scratch, Baker simply built a setup to run two straight-six Ford igntitions (one for each bank of cylinders). As you can guess, there are no Cleveland V12 headers on the market, so Baker just up a few different sets and made his own. The oil pan is notched to provide clearance for a Cadillac Eldorado transaxle. As far as we are aware, this is the only Cleveland headed V12 in existence, and it definitely has a ton of character. Hopefully, we'll be able to follow up when Baker gets it into a car. In the meantime, you can check out the dyno chart here. Hello Baker. Congratulations on the project and initiative. My question is: Will you be making these products available for sale so that other enthusiasts can realize the dream of having in their cars that magnificent engine that you have developed? Once again, congratulations.